The main reason I saw Cleo from 5 to 7 was because it was directed by a woman. Call me strange or whatever, but whenever I watch a film directed by a woman, I feel a sense of pride (even when I'm watching Mamma Mia). However, there was a certain sense of pride that I felt while watching Cleo that I definitely didn't feel whilst watching Mamma Mia. This film was just indescribably great. It takes place in real time, starting from 5pm. It follows beautiful singer Cleo (Corinne Marchand) throughout an hour and a half of her life, as she waits to find out the diagnosis of her cancerous tumour and whether it is fatal. From the get-go, this film seemed pretty much perfect for me: I have a major weakness for these simple films where we observe a certain character going through life. This one is a step ahead of the other ones I've obsessed over in the past. For one thing, it is French, and I can't help it if I fall in love with anything from that country. Another thing is that it is so goddamn beautiful. However, the thing I liked the most was that this film started off in colour - and it had every reason to go on that way - but Agnes Varda chose to film the rest in black-and-white. Glorious black-and-white. From there, everything is more beautiful, more eerie, more feeling. Just the way I like it. Now I'm not the kind of girl who beats the feminist drum, but this film is something different to what I usually watch in that respect. Cleo is a character who starts off very vain and obsessed with her appearance - just like most other female film characters. She buys things in order to make herself feel better. She has a mask which she's carefully procured over the years because she is scared of what other people think of her. As the film goes on, however, she starts stripping off this mask and starts exposing us to the true fear she's feeling over her biopsy results. She searches for ways to calm herself, in the hope that someone else will be able to help her with her ordeal. This leads her to her supposed best friend Dorothee, who doesn't help all that much. It's then she realises there is only so much other people can do for her - which is something that I can relate to. What I love about the way that Varda has crafted this character and this film is that she isn't obsessed with having the female talk only of love, men and beauty. The female isn't constantly pitted against other males. I'm not sure why, but I was fascinated by that. It was a brilliant film, which finishes just at the right moment. And who knew that when I sat down to watch this film on a Friday night that I'd get a life lesson? Now, The 400 Blows was a film that I liked a little less, but still appreciated all the same. 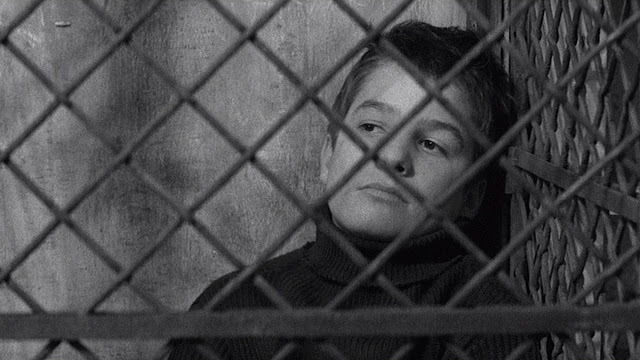 Known as one of the first French New Wave films, Francois Truffaut tells the story of a young, misunderstood boy Antoine (Jean-Pierre Leaud) who goes into a life filled with petty crime because he is left without attention. This film struck me because I realised that it is the kind of film that we should be watching at high school, but unfortunately New Zealand schools wouldn't dare to go that far. Everything about the story and the way it is made is perfect for adolescents to get a good feeling of how far films can go. Antoine's story is heart-breaking: he's seen as a troublemaker, and frequently gets the blame for things, even if he doesn't deserve it. Because he is young, everyone seems to see his troubles as a result of him being 'underdeveloped' in terms of life. Despite the fact that his parents and his teachers were once kids like him, they've forgotten what it is like to be a kid, and therefore don't understand what Antoine is going through. He gets sent to a prison-like school in order to straighten him out, but the truth is that this is the worst thing for him. It's just another excuse for his parents to ignore his problems. Which made me very upset, even moreso now I've mulled the film over. I am not that familiar with Truffaut's work (though that will change throughout the month), but I can say that I loved the way this was made. The editing, particularly during Antoine's monologue, was particularly striking. Just the way Truffaut sets up and shoots scenes is so indescribably awesome. The score, too, was brilliant. I don't really have much else to say about The 400 Blows at the moment, because I feel it would get better on a rewatch. Let's just say, that final shot will be etched in my memory for years to come. What do you think of these films? Also, what French New Wave film do you recommend I see next? They should give you a good taste of what French New Wave has to offer. You sure can do that if you want. And I want to check out Vivre sa Vie, so I might check that out next. What Hiroshima Mon Amour, that is an AMAZING film. One of my favourites. Also, really liking this feature, Stevee! Also surprised no one has mentioned Robert Bresson here. He's quality. It's quite hard to get into his films, though, but once you do, it's so worth it. And meant watch Hiroshima Mon Amour, not what - seems like I am spamming your post today Stevee! I'm going to watch Hiroshima Mon Amour later in the week. And I'm getting into some Bresson some time soon with Au hasard Balthazar. I went through a huge French New Wave phase after watching The Dreamers, though I kept it more or less contained to Truffaut and Godard. I should really look at the other filmmakers too. I haven't seen Cleo, but 400 Blows is amazing. my favourite in the Antoine Doinel series is Stolen Kisses though. That one was kind of quirky and it really spoke to me personally. The Dreamers is one film I really want to see. One day, one day. Interesting that you bring up Varda, cos she's one of these people who kind of complicates the whole idea of the "French New Wave". There was indeed this sudden eruption of new voices in French cinema in 1959/60, several of them connected with the magazine Cahiers du Cinema (Godard, Truffaut, Chabrol, Rohmer, Rivette, etc), but you also had the so-called "Left Bank" crowd (Varda, Resnais, Jacques Demy, Chris Marker) who were brought into the movement (such as it was) by the critics but most of them already had active careers and didn't feel part of the New Wave. And then you have people like Malle who came up around the same time as the New Wave, but it's still debated whether or not he was ever really "part" of it. It's a kind of vexed issue, like most movements whose existence is/was postulated by critics rather than any artists who may have been involved. Truffaut is an interesting case, too, having led the intellectual/theoretical charge in the pages of Cahiers against the then-current state of French cinema and its valorisation of writers over directors, which is what all the Cahiers mob really wanted to be. And yet, from what I gather, he kind of turned the fastest of any of them into the kind of "safe" conventional filmmaker he'd decried (which is not necessarily an argument against his films, and I haven't seen enough to judge). Plus I have seen it argued, with some justice, that there was a sort of politically conservative impulse behind Truffaut's thinking and the whole Cahiers "auteur" policy, so who can say. Claude Chabrol's "Le beau Serge" usually gets the nod as the first "New Wave" film. Tyler can probably point you towards a copy of it on Youtube. Eric Rohmer is apparently great if you like lots and lots of talking without much action, and Jacques Rivette is apparently also great if you can actually find anything by him at all. I continue to think that Jean-Luc Godard is one of the biggest tricks ever played on cinema. I will try and have a look for the works by those directors. Particularly Jacques Rivette. I've heard he's great. Rivette is excellent but many of his best movies are really, really long. The only great one I think is left on YouTube is La Belle Noiseuse, which is four hours, and I don't think you'd love it. Celine and Julie Go Boating is a fantastic Rivette film you would enjoy, but sadly it was removed from YouTube. The only other Rivette film I've seen is Va Savoir, which is available via Fatso and which you will probably like. I haven't seen Le Beau Serge, but I thought Bob the Gambler by Jean-Pierre Melville was the first New Wave film. I haven't seen anything by Eric Rohmer. Anything by Truffaut is a pretty safe bet for you, Stevee. James mentions that Louis Malle stands out as not particularly noticeable in the New Wave haze. I disagree. He's one of my favourite French directors. I recommended two of his films earlier, Elevator to the Gallows and The Fire Within (the latter is on YouTube, the former on Fatso). What makes Malle more accessible is that he also made films in America as well as France. He's a mixed bag, but there are a lot of goodies if you know where to find them. Godard is a tricky director, but I'm almost certain Stevee will like Vivre sa Vie. Louis Malle is another director I'd like to check out. And I did love Breathless, so that's one Godard that I liked! Stevee, it's great that you got to see Cleo from 5 to 7. I caught up with it a few years ago (pre-blog) when I went through some classic French New Wave films. It was my favorite of the group and was a huge surprise. It's a gorgeous movie like you mention, and I was gripped throughout the story. Cleo from 5 to 7 is really good, isn't it? Loved it. I was really frustrated the first time I saw The 400 Blows. I think it's because it just ends and I wanted a little bit more. I guess I didn't hate it though since I do own it. You might have inspired me to give it another chance. Thanks, Stevee. That's the way most French New Wave films are, I hear :) I kinda like my films that way. I've only seen The 400 Blows which I love and the only Varda film I saw so far is Vagabond. That I recommend. As for films of the French New Wave to see. Well, I can't really say as I've only seen a handful of these films. The ones that I've seen I will recommend. Truffaut's Jules & Jim, Jean Luc-Godard's Breathless, Bande a Parte, and Made in U.S.A., and Alain Resnais' Last Year in Marienbad. The last of which is not an easy film to watch due to its lack of plot but truly one of the most beautiful films ever made. Oh, BTW... in case you haven't read my contributions to the 10 Best Directors of All-Time Relay Race... you're next. I do want to see Vagabond. I'll probably check out Last Year in Marienbad. I'm definitely checking out Breathless and Jules & Jim, though! Stevee, you will like Breathless and Jules and Jim. If you don't, I'll be surprised. Last Year at Marienbad is a film I was so close to recommending to you. The only reason I didn't was because there's not much of a plot in it, but it is truly one of the most beautiful, stunning movies ever made. The visuals are hauntingly poetic. I absolutely adored it. However, I did recommend another film by the same director Alain Resnais, called Hiroshima mon Amour. I think you'll like that one. I might watch Last Year at Marienbad in the future, but I probably won't have much of a chance to fit it in. Must check out Jules and Jim, though. I've not seen Cleo from 5 to 7 yet. I'll have to check it out soon. As for The 400 Blows, I'm not a fan of Truffaut in general. I get its significance, I just don't connect with the character at all. Don't Shoot the Piano Player and Pocket Money/Small Change are two much better films. I'd recommend dipping your toes into Godard with either A Woman is a Woman if you want something fun or Vivre Sa Vie for a serious, dramatic story. I'll also second Last Year in Marienbad. A bizarre, brilliant film. You will have to check out Cleo. So good. That's fair enough - I found it was a tough film to really tap into, but now I've mulled it over I like it a little more. I'm gonna get into some Godard. Vivre Sa Vie seems like a good start! And I'll try watch that one, too. Godard is ostensibly the biggest name in French New Wave, but a tricky director. Some of his films are easy to watch, others are insanely difficult. I love most of them, but there are certain ones you won't like. Vivre sa Vie is a fairly safe bet, as is Breathless, Bande a Part, Alphaville and maybe Masculin Feminin. I really loved Breathless. I'm trying to track down Vivre sa Vie and Bande a Part.